Help seniors in the Clintonville area by shoveling snow! The Village in the Ville is a member-driven program for adults 50+ in the Clintonville area. Our goal is to meet members' needs through organized social and educational events, volunteer assistance, referral to service providers, and opportunities for engagement within the Clintonville community. Each winter, we match each Village member with one primary volunteer and, if possible, a secondary volunteer. 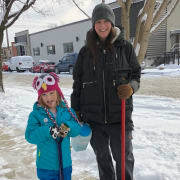 Volunteers are responsible for coordinating with their member after inclement weather to remove snow and ice from walk ways and/or driveways. Sometimes members are traveling and don't need snow removed, and sometimes members need snow removed before a specific appointment so they can leave their house. We leave it up to volunteers and members to communicate and agree on a time. If the primary volunteer is unable to perform the snow removal, we hope to have secondary volunteers in place to fill in. We have many opportunities for volunteering with the Village. If you're interested in our mission, please reach out! Time will depend on weather conditions and how fast you like to shovel snow! Volunteers should be able to communicate with their assigned Village member to coordinate time for snow removal. Volunteers should also be able to physically shovel snow and ice.